1. Heat 1/2 tlsp oil in a pan. 2. Stir-fry the chicken slices until browned and keep aside. 3. Heat the remaining oil and stir-fry the lemongrass for 20 to 30 seconds. 4. Add the cabbage and baby corn. Cook for a minute more. 5. Add chilli sauce, oyster sauce, vinegar and sugar. 6. Simmer for 2 minutes or until corn is tender. 7. Add the chicken and stir well to mix. 8. Add 1/4 cup of basil and 2 tblsp of cashewnuts. 9. Transfer to a plate. 10. Garnish with the remaining basil and cashews. recipe inspired by Yummy magazine. 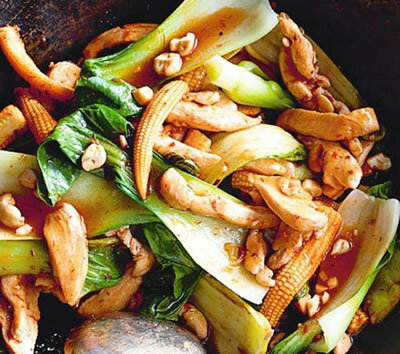 Feel free to comment or share your thoughts on this Lemongrass Chicken with Basil and Cashews Recipe from Awesome Cuisine.